Thanksgiving is just weeks away and Table 45 offers you our annual dine-in or dine-out options! The Prix Fixe Dinner is $28 per adult ($14 for children under 12) plus beverage, tax and gratuity. Additional sides of the Stuffing, Potatoes or Brussel Sprouts are available for $6 per order; additional turkey is $7 per person. Don't want to dine out but don't want the hassles of cooking either? We still have you covered! Table 45 will prepare you a Complete Take Home Turkey Dinner that serves 10-12 people! Complete Turkey Dinner is $180. 10% discount available to Cleveland Clinic Employees with ID. Orders must be placed by 4PM on Monday, November 21st with our Events Coordinator, Ashley, at 216.707.4167. Orders may be picked up on Wednesday, November 23rd during regular business hours or on Thursday, November 24th from 10am-3pm. For more information, please contact our Events Coordinator, Ashley Martin at 216.707.4167. Fall Events at Table 45! Welcome to Fall! Table 45 offers many exciting events and delicious reasons to celebrate the new season! In early October we celebrated our 4.5 year Anniversary and, to commemorate this event, we selected several past menu items from over the years and asked our Facebook Fans to vote on their favorites. Four voters were randomly selected to attend a Chef's Table tasting with a guest to sample the top four menu items and then cast their ballot on which item would return on our new Fall & Winter Menu. The vote was close resulting in a tie between the Golden Trout and the Butternut Squash Ravioli. The Ravioli won out in the end and is back on the menu! The Butternut Squash Ravioli is served with Sauteed Spinach and Sage-Truffle Cream Sauce topped with Hazelnuts. In addition to our 4.5 anniversary and Restaurant Week, we are also introducing our new Fall-WInter Menu! Check out the menu link on our website and stop in soon to indulge in one of our many new exciting items! The Stuffed Squash with Moroccan Couscous, Fig Compote and Cumin-Yogurt Sauce is an amazing Vegetarian option that is also beautiful and delicious! We are also offering a unique twist on Chicken "Pot Pie" with Chicken Confit, Fettuccine Noodles, Peas, Carrots and Fennel tossed in a creamy Truffle Sauce topped with Bread Crumbs! Our World Cuisine menu continues with Greek Moussaka, a Peruvian Chicken Entree, Chinese Style Noodles and other dishes influenced from flavors and cuisine from around the world! Celebrate Fall at Table 45! Easter and Mother's Day Brunch! Fresh Waffles and Omelettes made to order! And don't forget... The Sweet Table! Brownies, Blondies, Cookies, Cakes and an assortment of Pastries and other Festive Desserts! Celebrate Valentine's Day all weekend long at Table 45! Be sure to try are newest libations as well! Celebrate the Holidays with Table 45! Open 365 days of the year, Table 45 is the perfect place to gather with colleagues, friends and family over the holiday season! Join us for dinner daily (including all Holidays) beginning at 3PM and lunch Monday-Friday beginning at 11AM, including Christmas Eve and New Year's Eve! We have both private and semi-private areas available to host a family celebration or a company Holiday event. Please contact our coordinator, Ashley Martin, at 216.707.4160 for more information. The Holidays are a special time of the year best spent enjoying the company of family and friends. Why waste time cooking in the kitchen when we can do it for you? With convenient, complimentary valet parking and an extensive menu, Table 45 is the place to come together to unwind and celebrate the season! Call 216.707.4045 or make your Reservation online today! Cleveland – Table 45, the award-winning restaurant in the InterContinental Hotel Cleveland, announces two unique, affordable Thanksgiving cuisine options, designed exclusively for Table 45 by Chef Zachary Bruell. Table 45’s most popular Thanksgiving offering is the take-home feast, a complete ready-to-serve gourmet holiday meal for 10 to12 people. Table 45’s take-home Thanksgiving includes a Whole Roasted Turkey with Apple Sausage and Sage Stuffing; Garlic Mashed Potatoes, Candied Sweet Potatoes; Green Bean Amandine with Bacon Lardons; Roasted Baby Carrots; Cranberry Sauce; Turkey Gravy; Bread Rolls; Apple Pie and Pumpkin Pie. “We revitalized the traditional Thanksgiving meal with bold seasonings, unique, fresh ingredients and flavorful marinades to enhance the holiday experience,” said Bruell. Table 45 Thanksgiving dinners are available for pick-up Wednesday, November 24 and Thursday, November 25 (Thanksgiving Day) from 10 a.m. to 5 p.m. The cost of this meal is $175. Additional charges apply for carving and for extra turkey, sides or pies. Table 45 take-home Thanksgiving meal orders must be placed by calling 216-707-4167 by 4 p.m. on Monday, November 22. Table 45 will also be open on Thanksgiving Day, serving a plated menu including choice of Butternut Squash Soup with Toasted Hazelnuts or Mixed Green Salad with Poached Pears, Candied Walnuts, Dried Sour Cherries and Cranberry Vinaigrette; Roasted Turkey Served with Sage and Roasted Chestnut Stuffing; Yukon Gold Mashed Potatoes; Buttered Brussel Sprouts; Cranberry Sauce; Turkey Gravy; and choice of Traditional Apple Pie with Tahitian Vanilla Ice Cream or Pumpkin Pie. This Table 45 Thanksgiving feast is $26 per person. Purchase dinner at each of the Zack's restaurants and earn a stamp on your ticket. Once all four stamps have been obtained turn in your ticket at any of the four participating restaurants to receive your commemorative Tour t-shirt and be entered into the Grand Prize drawing. 10 semi-finalists will be randomly selected. They and a guest will be invited to a wine tasting dinner at Table 45 on December 14, 2010. One grand prize winner will receive a spectacular four-course dinner for eight people, specially designed and prepared by Zack Bruell and served in their own home. Contest Rules: Purchase of dinner is defined as purchase of entrée. 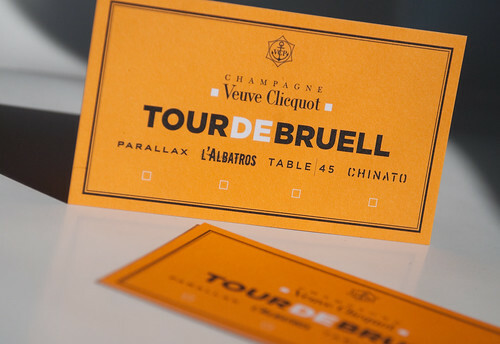 Gift cards will not receive credit towards Tour de Bruell Cardholders must receive one stamp at each of the four participating restaurants. Wine Tasting Dinner date is subject to change. Grand Prize winner does not have to be present at the wine dinner to win. Date for redemption of Grand prize dinner is subject to availability by contest winner and Chef Zachary Bruell. Table 45 Fall Wine Classes!